The good news is Stag Arms’ 3T-M is a one of the more visually distinct ARs I’ve handled recently. The better news is the visual distinction is the result of some practical improvements that make this one of the best competition ARs out there, and a darn good firearm for just about any use to which you’d put a modern sporting rifle. The most immediately apparent feature is the Diamondhead low-profile, free-float 13.5-inch VRS-T handguard. It wears a full-length Picatinny rail on top, has a double row of horizontal cooling/lightening slots on either side below the rail and a third double row on the underside, and includes deep, gentle scalloping on the sides. This scalloping is the real star of the show. It serves two purposes: It forms finger grooves the length of the guard offering comfortable handholds regardless of hand placement, and it provides some purchase and stability when the rifle is pressed against a barrier for support. Further, the VRS-T handguard is devoid of sharp edges and heavily anodized to the point it feels, well, soft. That texture and the handguard’s relatively narrow circumference make the 3T-M extraordinarily comfortable. In fact, comfort was the quality remarked on first by nearly everyone to whom I handed the rifle. The VRS-T handguard will accommodate only Diamondhead rail sections, but that’s fine. There’s no requiring you suffer sore palms and high cost just for the potential to mount gear you may have no interest in installing. Picatinny rails have been a godsend, but you can take anything too far. Popping out the base of the grip reveals a small storage area. The handguard stops just behind the military-style flash suppressor. The handguard’s length combines with its low-rise profile to make the 3T-M’s barrel appear longer than it is. It looks to be 18 inches, yet in actuality the chrome-lined, 4140 steel tube is only 16 inches long. (The gas tube is a standard carbine-length unit.) Additionally, the leading edge of the handguard sweeps up and back, giving the gun a swoopy, “racy” look. The other Diamondhead components that enhance this rifle are the aluminum, flip-up sights, front and rear, which constitute an upgrade from the polymer versions found on other Stag Arms rifles. The sights easily flip up and lock into position with little pressure. Depress a button on the side of the base, and they flip down out of the way for installation and use of optical sights. A bonus of the lengthy handguard is it allows the sights to be mounted at a very long sight radius as compared with most other carbine-length ARs. What puts the “M” in 3T-M is the inclusion of a Magpul ACS six-position stock and the same company’s MOE pistol grip. Both offer light weight, excellent ergonomics and onboard storage. The 3T-M, while it should prove useful for a host of roles, is aimed specifically at 3-gun and other action pursuits. In fact, Stag Arms fields a 3-gun team that competes and offers the factory feedback on what features work best for action shooting. The 3T-M represents the current culmination of that input. Its 1:9 twist barrel favors the relatively light projectiles used at the predominantly close ranges encountered in action shooting. 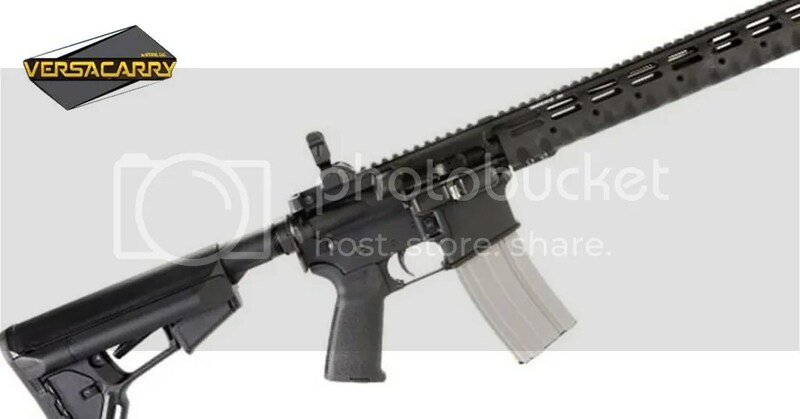 As mentioned previously, its handguard works well with the numerous holds used in 3-gun and similar sports. Further, at only 7 pounds, 6 ounces, the rifle is light and easy to maneuver. While some may consider a racegun less than practical for tactical use, such is not the case with Stag Arms’ rifles. Since both 3-gun scenarios and real-life tactical situations often demand fast, accurate and reliable engagement, what works in 3-gun often translates well to the street. In fact, Stag Arms’ competitive shooters advise law enforcement operatives of new discoveries and techniques just as they relay hardware critiques to the company’s designers. In turn, law enforcement provides its insight to the company, too. Magpul’s stock adjusts easily between six positions, offering 3.5 inches of travel. It, too, offers a small storage space. The 3T-M functioned with 100 percent reliability with all brands of ammo tested, even when I mixed brands and bullet weights in the same magazine. Everything went bang and brass was ejected strongly. Controls functioned distinctly and certainly, without play. I mounted a 1-4X Elcan Spectre scope on the rifle because, well, I have one. After getting dialed in, the combination proved a nice match, whether fired standing, moving or from the bench. As can be seen in the accompanying tables, accuracy was more than satisfactory with the right loads. The Stag Arms 3T-M proved a very sound and capable rifle in its base configuration. It is remarkably comfortable regardless of your hand placement, and handles simply and well. I’d opt for one of the trigger upgrades, but that’s almost always the case. Anyone who is in the market for an action-shooting AR that might also serve well in a tactical role should give very serious consideration to the 3T-M.
Stag’s new rifle is slender and straightforward. Controls are conventional and operate well.